If you have ever come across this book, you know that there is absolutely no explanation needed. 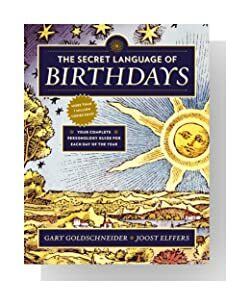 If you have never heard of The Secret Language of Birthdays by authors Gary Goldschneider and Joost Elffers, you are in for a nice surprise. This book uses astrology and numerology to pinpoint someone's personality based on the day they were born. Every single day of the year is listed with a detailed two page analysis. When I say pinpoint, I mean target with laser precision. It appears to be correct almost every time, and we aren't talking about broad profiling that fits everybody, either. When thinking through 21st birthday ideas, the birthday key is often overlooked. A 21st birthday key is a long held tradition symbolizing coming of age and responsibility. In times of yore, the elders of the house used to gift the key of the home to the freshly minted 21 year old on their birthday. It was customary that those who entered through the door of adulthood could be trusted as an adult with the lock to their home. Although many young adults rent, or even own their own home, nowadays, it is still a symbolic, meaningful gesture of growing up, age and responsibility. Have you ever seen the movie The Game with Michael Douglas? If you haven't, I won't spoil the entire movie for you, but that is quite an experience! A company going by the name of Cloud 9 Living has some really unique experiences. Although nothing can quite top The Game, one experience that caught our eyes in particular was called "The Illuminati Hunt," which is billed as an intellectual challenge. The game consists of an after dark treasure hunt where teams armed with UV flashlights find scattered clues and solve riddles. At around $1700, it might appear kind of expensive at first, but when split up among 20 party goers, the price comes out to be less than $100 per person, for a really unique 21st birthday gift! A custom, handcrafted, bobblehead would be an excellent choice to add to your list of 21st birthday gifts, forever capturing and immortalizing the Birthday Boss' youthful appearance that years of responsibility, and being an adult, will surely strip them of. As time wanes on, the bobblehead will innocently mock the recipient with its' unwavering youthful appearance. You should put something to that effect on its' gift tag, too. Custom bobbleheads are $79 and if you want a custom youthful body, add an extra $20. Visit RockBobblehead for more info. What was going on in the world, exactly 21 years ago, on their birthday? How about an original press printed newspaper? Yes. You can order original newspapers from (almost) any date that you specify, even targeting the state or region. These newspapers weren't just kept in someone's basement, waiting for they day they would be sold as some novelty gift. No, they were handled by diligent researchers, and archived in protective leather binders. No coffee or jelly stains on these papers. Simply Personalized states that they are the source for newspaper back issues, and that everyone else orders from them. Check them out, but place your order quick, because once an original is gone, it's gone. Reprints just aren't the same.